Free shipping on Applied Nutriceuticals Free Test XRT Caffeine Free! In addition to the increased mental and physical energy boost, our revolutionary new Free Test XRT formula utilizes several new innovations from our original Free Test?. 1. Flexibility ?Free Test XRT is a functional formulation that can be used effectively in a variety of stacking situations. It can be used in conjunction with Applied Nutriceuticals Fat Free AM? and Fat Free PM? as a top-notch cutting stack, or it can be taken alongside HG4-Up? or IGF-2? as a potent mass-enhancer. If you want to get ripped and vascular or strong and full, FreeTest XRT is a must-have before your workout. 2. Feel?researchers at Applied Nutriceuticals wanted to give Free Test XRT something extra that would really make it stand out above the rest. On this note, we added a sensory experience to the formulation that makes it completely unique: a flavored outer coating that enhances the boldness of the formulation. The result is a boost in energy that will improve your pump, mood, and libido after the first few doses. 3. Results?if you want to get strong, ripped, and gain size, Free Test XRT (especially when stacked with HG4-Up?) has you covered. The compounds in Free Test XRT utilize the sTAR and ∆5 pathways to heavily influence a marked TGenerative response, while other ingredients in XRT have powerful modulatory characteristics to prevent your gains from being eaten away by stress-induced catabolism. Free Test XRT contains dehydroepiandosterone (DHEA), an ingredient associated with an enhancement of the anabolism (growth) to catabolism ratio. Higher DHEA levels are normally associated with lower levels of cortisol, which is a catabolic hormone that tears down muscle tissue. Less cortisol is usually synonymous with less catabolism (20-21). DHEA, along with Forskolin (another component found in Free Test XRT? ), have been shown in several human studies to increase bioavailable T (Free T or FT), as well as increasing total T levels (TT) and NO/cGMP levels. Elevation of these markers of musculature commonly leads to an augmentation of factors that initiate recovery and growth response in skeletal muscle (2-4,12-13,16). Forskolin and DHEA may also augment cAMP and cGMP levels and trigger soluble guanylate cyclase (sGC) in basal Leydig cells (18-23). cAMP elevation is a crucial piece of the puzzle in creating both an anabolic and thermogenic state, and XRT contains one of the best compounds available for triggering dramatic increases in cAMP levels. Research on forskolin has demonstrated the ability of the compound to enhance lipolysis and enhance natural T production, meaning that forskolin has the potential to act as a powerful fat loss agent, as well as being a potential anabolic aid (2-4,12-13, 16). Another ingredient in XRT, 7-Methoxyflavone, may have the ability to positively modulate estrogen and allow for the suppression of estradiol (E2) and estrone (E1). These effects may also improve the (T:E) ratio (22-25). DiCalcium Phosphate, Microcrystalline Cellulose, Stearic Acid, Natural and Artificial Cinnamon Flavors, HPMC (Hydroxy Propyl Methyl Cellulose), Polyethylene Glycol (PEG), Magnesium Stearate, Silicone Dioxide. 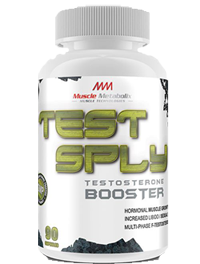 Muscle Metabolix Test SPLY 90ct, BOGO 50% Available!